Verkäufer Bay Harbor Brokerage, Inc. The Gran Tursimo 40 recreates the sport cruiser concept. Designed by the talented hands of Nuvolari and Lenard, this novel variation offers as much pleasure to the eye as sensations and driving. The design of this boat is harmonious with perfectly organised interiors and a high quality of finish. 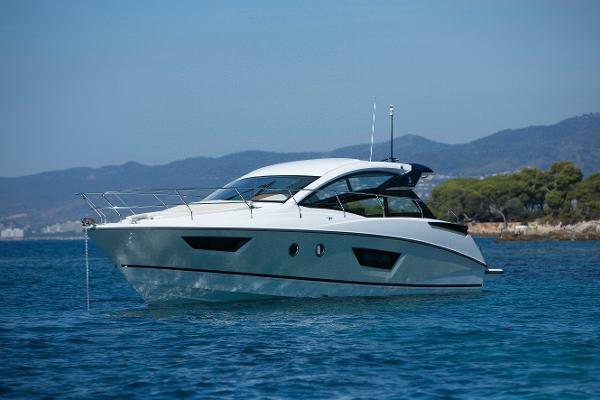 The slender line of the Gran Tursimo 40, underlined by her hardtop and well-designed side glazing, emphasize her pronounced sporty character. With her central driving console and the latest generation of Air Step® hull, she offers excellent sensations and safety when travelling at up to 38 knots. The space in the cockpit is generous and organised in an unusual way. It can seat up to 11 people. With two layout possibilities, the outdoor galley (to aft or in the cockpit) adapts to different lifestyles on board.